Our faces change as we age, losing elasticity and sagging, while the shape of the face changes and seems heavier. A skilled plastic surgeon can help reduce the effects of aging and restore your youthful appearance. 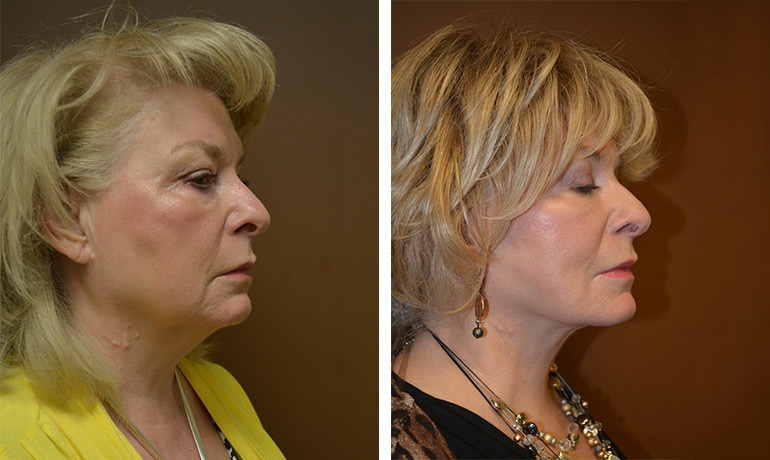 Our procedures can elevate your cheeks, flatten folds, tighten jowls, redrape the neck, remove excess skin and more. Your skin isn’t replaced—just restored and rejuvenated. Dr. Stein is highly skilled in refining areas of the face and neck, as well as alleviating signs of congenital deformities (birth defects) and abnormalities from accidents or disease. Aging causes your muscles to weaken, leading to excess fat around your eyelids, sagging eyebrows, drooping upper lids and bags and dark circles under your eyes. Baggy skin can impair your vision and make you look and feel older. 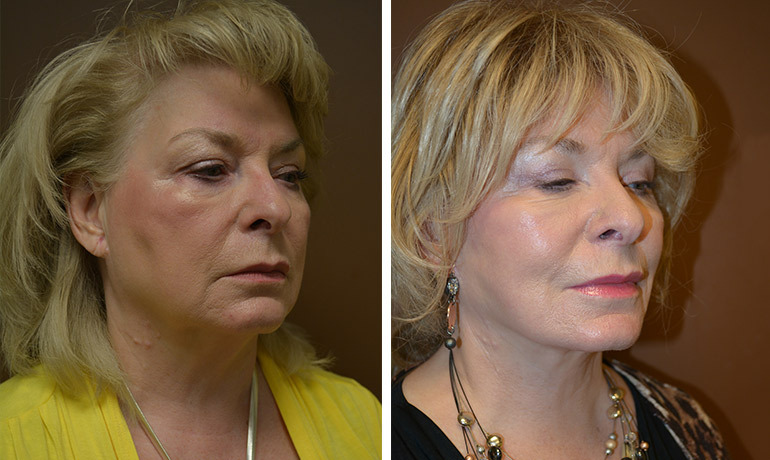 Cosmetic eyelid surgery, or blepharoplasty, removes excess skin, muscle and fat to repair droopy eyelids. Knowing the risks and benefits are important to decide if the surgery is right for you. 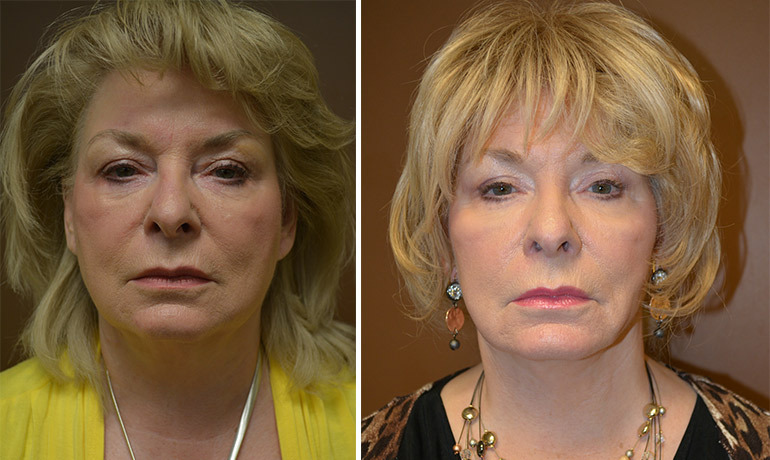 Blepharoplasty usually takes one to three hours, depending on the extent of the surgery. Typically, incisions are made following the natural lines of your eyelids—in the creases of your upper lids and just below the lashes in the lower lids. The incisions may extend into the crow’s feet or laugh lines in the corner of your eyes. The incisions separate skin from underlying fatty tissue and muscle, remove excess fat and often trims sagging skin and muscle. The incisions are then closed with very fine sutures. If you have a pocket of fat beneath your lower eyelids but don’t need to have any skin removed, a transconjunctival blepharoplasty may be performed. This procedure involves making an incision inside you lower lid, leaving no visible scar. It is usually performed on younger patients with thicker, more elastic skin. After the surgery, it should take about two or three days before you can read or watch tv. However, you will not be able to wear contact lenses for about two weeks, and possibly longer as they may feel uncomfortable for a while. Most people feel ready to go out in public (and back to work) in a week to 10 days. After that time, depending on your rate of healing and your doctor’s instructions, you’ll probably be able to wear makeup to hide the bruising that remains. 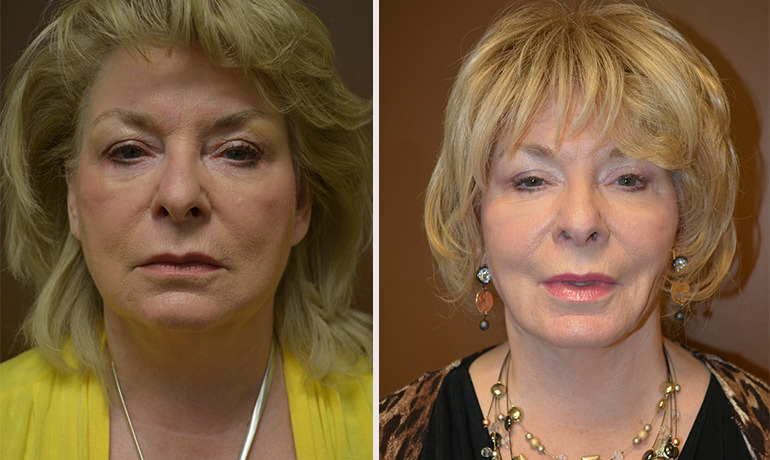 Any and all concerns related to blepharoplasty can be discussed with Dr. Stein at Somerset Center for Plastic Surgery. A brow lift releases the muscles and tissues that cause furrowing or drooping, smoothing the forehead, raising the eyebrows and minimizing frown lines. Dr. Stein uses an endoscope—a viewing instrument that allows the procedure to be performed with minimal incisions. A brow lift is commonly performed to reduce signs of aging, while also helping individuals of any age who develop furrows or frown lines from stress or muscle activity. Sometimes a low, heavy brow or furrowed lines above the nose are genetic and a brow lift can create a more refreshed look. Dr. Stein makes three small incisions on each side of the scalp. No hair is shaved. An endoscope—a pencil-like camera device connected to a television monitor—is inserted through one of the incisions, allowing Dr. Stein to have a clear view of the muscles and tissues beneath the skin. Using another instrument inserted through a different incision, the forehead skin is lifted and the muscles and underlying tissues are removed or altered to produce a smoother appearance. The eyebrows may also be lifted and secured into their higher position by sutures beneath the skin’s surface or by temporary fixation screws placed behind the hairline. About a week after your brow lift, you will return to have your stitches removed. Swelling and bruising can last for about a week and is very common. At least two days after surgery, you should keep your head elevated to help the swelling. Gently applying ice packs to the affected area can also help. We recommend avoiding heavy lifting, vigorous exercise or other activity for the first few weeks after surgery. Itching may be a side effect, but is much milder than a traditional brow lift surgery. You may also experience numbness or tingling, which will also subside over time. Most patients can return to work or school in 10 days or sooner, depending on individual rate of recovery. Patients often don’t realize how much a sagging forehead contributes to signs of aging until they see the results after surgery and realize how much younger and well rested they appear. Although a forehead lift does not stop the clock, it can reduce some of the more severe effects of aging. As time passes, you may want to repeat the procedure. Aging, gravity, exposure to the sun, day-to-day stresses can all impact our appearance. Deep creases form between the nose and mouth, the jawline grows slack and jowly and folds and fat appear around the neck. A face lift can restore a firm contour, giving you a more youthful, fresh appearance. This is accomplished by removing excess fat, tightening underlying muscles and “redrawing” the skin of your face and neck. 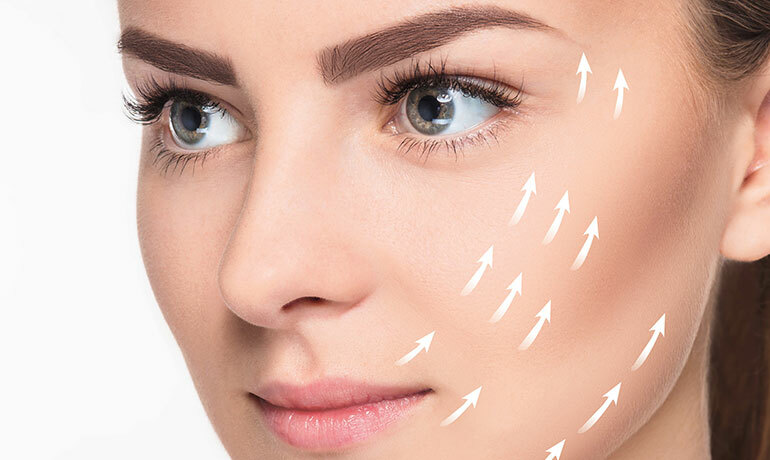 After the skin, fat and muscles have been tightened, other procedures such as laser resurfacing and microdermabrasion can improve the quality of your skin. Face lifts are individualized procedures that usually take several hours, or longer if you are having more than one procedure. 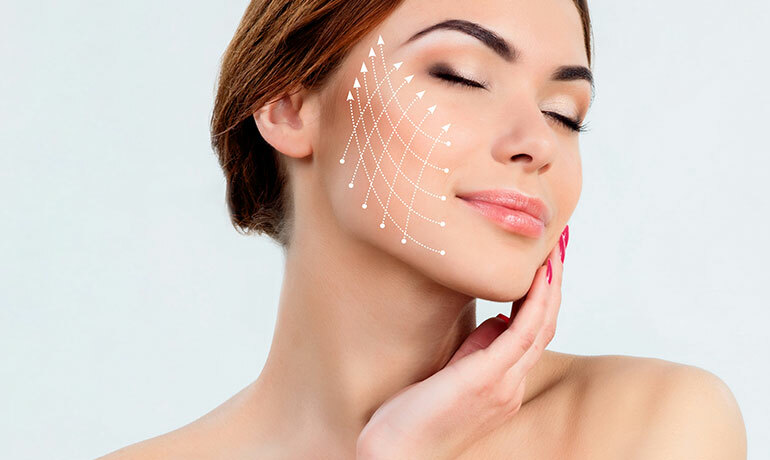 The exact placement of incisions and the sequence of events during face lift surgery depend on your facial structure. Usually, incisions begin above the hairline at the temples, extend in a natural line in front of the ear (or just inside the cartilage at the front of the ear), and continue behind the earlobe to the lower scalp. If the neck needs work, a small incision may also be made under the chin. The skin is separated from the fat and muscle below and — if necessary — fat may be trimmed or suctioned from around the neck and chin to improve the contour. Underlying muscle and membrane is tightened, the skin is pulled back, and excess removed. Stitches secure the layers of tissue and close the incisions. Following surgery, a small, thin tube may be temporarily placed under the skin behind your ear to drain any blood that might collect there and your head wrapped loosely in bandages to minimize bruising and swelling. Prepare to pamper yourself after your surgery. Your skin will be tender and numb. Everyone heals at a different pace, and Dr. Stein will provide more specific guidelines for resuming daily activities. All patients should plan on avoiding strenuous activity for at least two weeks (walking and mild stretching are fine). We also recommend restraining from alcohol use, steam baths and saunas for several months. Plenty of rest is important to allow yourself to heal comfortably. In the first few weeks, your features may be distorted from swelling, facial movements may be slightly stiff and some bruising may persist. By the third week, you’ll look and feel much better. Most patients return to work in about 10 to 14 days after surgery. Face lifts may turn back the clock, but they don’t stop it. Your face will continue to age, and in about five to ten years, you may want to repeat the procedure. Still, the effects of just one face lift are lasting, and you’ll continue to look younger than if you’d never had one! As you age, sun damage and environmental pollutants damage your skin, creating lines and wrinkles on your face. Laser resurfacing can help minimize fine lines as they begin to occur, particularly those that form around the mouth and eyes. Laser resurfacing uses a laser to remove areas of damaged or wrinkled skin layer by layer. Usually used to treat fine lines and wrinkles, facial resurfacing is also an effective treatment for facial scars and uneven pigmentation. Laser resurfacing can be done on the entire face or on targeted areas. There are several different types of lasers for resurfacing the skin that range from one treatment to several, depending on the size of the area being treated and the severity of the skin condition. You may experience some swelling and discomfort. Cold packs are usually recommended to reduce swelling. If a bandage was applied after surgery, it may be changed in a few days and then completely removed after about one week. Scabs may form and last for up to 10 days. If you experience pain, over the counter pain medication may be taken. Recovery time depends on the depth of resurfacing and your capacity to heal. Redness may persist for several weeks or longer, but will gradually lighten to pink and then to a more natural color. Makeup can be applied about two weeks after the procedure to cover up redness, if you prefer. Laser resurfacing generally removes most of the fine wrinkles and imperfections in the treated areas, but natural facial movements and expressions can cause some lines to reappear. Like most other methods of skin resurfacing, laser treatments may be repeated to maintain the desired results. Lip augmentation makes your lips fuller and more attractive by increasing their size. 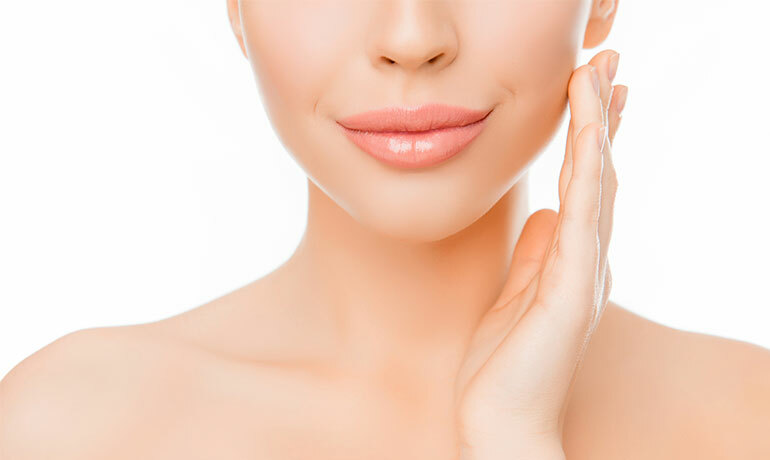 Whether you have thin lips or want to add a youthful fullness to your lips by reducing fine lines and wrinkles, a lip augmentation may be the solution you’re looking for. Most lip augmentations take between a half hour to two hours, depending on the procedure. There many different types of lip augmentation procedures, each having specific pros and cons. Dr. Stein will discuss options with you to help you choose the best course of action for your desired results. Lips may swell and hurt immediately after surgery, but the swelling can be controlled with cold compresses. Talking and chewing should be avoided as much as possible in the first 48 hours after surgery. Oral pain medications may be taken to control any discomfort, but most people report little discomfort in the days following the procedure. 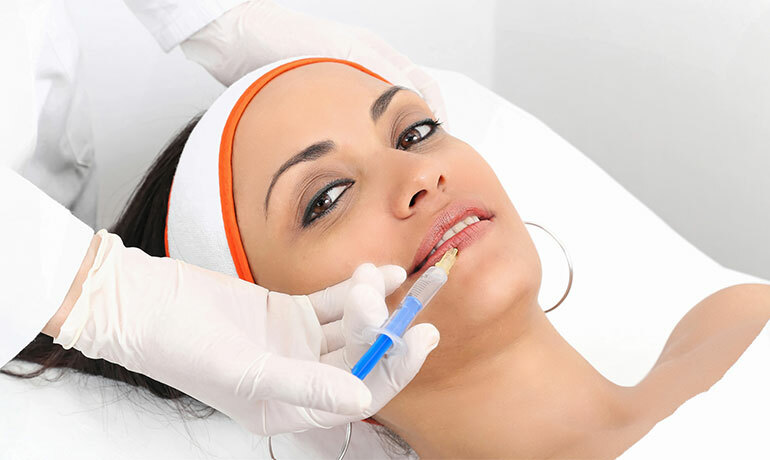 Lip augmentations provide temporary results that last between nine months and one year. The procedure can be repeated. After an injection procedure, most people return to normal, public activities within a few days, though bruising and swelling can last as long as a week. If you are experimenting with a new look, you may want to begin with a temporary method. 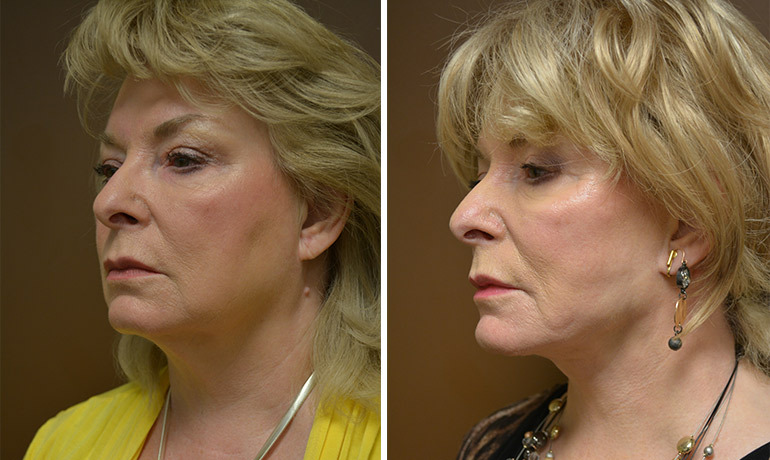 An S-Lift is an alternative to a traditional face lift. Named for the S shaped incision hidden in front of the ear, the S-Lift provides an overall lift to the lower third of a patient’s face and cheeks. A mini S-Lift does not treat the upper third of the face. However, baggy eyelids, crow’s feet, descended eyebrows or a wrinkled forehead can be treated with a brow lift or an eyelid lift. Your personal cosmetic goals will determine which procedure or combination of procedures will give you your desired results. In an S-Lift, incisions are made at the junctions between the face and ears at the hairline. The skin of the face and neck is gently elevated and the deeper tissues are tightened to provide a longer lasting lift. Excessive skin is trimmed and then the incisions are precisely closed using a hair-sized suture so that no one will ever know that you have undergone face lift surgery. Patients typically experience minimal discomfort and are free of pain medication a few days after their procedure. You will wear a light bandage around your head to protect the incisions. Mild bruising and swelling usually peak at three to five days after your face lift before gradually subsiding over about two weeks. Work activities that do not involve significant physical exertion are permissible after two weeks, but you must avoid lifting, bending over and all other strenuous activities for the first few weeks. After three weeks, low impact exercise is allowed, with a return to unrestricted activity after six weeks. Ear surgery, or otoplasty, is usually done to set prominent ears back closer to the head or to reduce the size of large ears. This operation is mostly done on children between the ages of 4 and 14. Ears are almost fully grown by age four. The earlier the surgery is done, the less teasing the child will have to endure. Cosmetic ear surgery usually takes about two to three hours, though complicated procedures can take longer. For prominent ears, it is common for Dr. Stein to make a small incision in the back of the ear to expose the ear cartilage. He will then sculpt the cartilage and bend it back toward the head. Non-removable stitches may be used to help maintain the new shape. Occasionally, a larger piece of cartilage will be removed to provide a more natural looking fold when the surgery is complete. Another technique involves a similar incision in the back of the ear. Skin is removed and stitches are used to fold the cartilage back on itself to reshape the ear without removing the cartilage. In most cases, patients will have a faint scar on the back of the ear that fades over time. Even if only one ear appears to protrude, surgery is performed on both ears to ensure a better balance. Patients are usually up and around within a few hours after surgery. However, you may choose to stay overnight with a child until all of the anesthesia wears off. A bulky bandage will be wrapped around the patient’s head immediately after surgery to promote molding and healing. Patients may experience slight throbbing or aching in the ears for a few days, but this can be relieved with medication. After a few days, we can replace the bulky bandages with lighter head dressing, similar to a headband. Follow your doctor’s directions for wearing this, especially at night. Stitches are removed, or will dissolve, in about a week. You should avoid any activity that can bend your ear for a month or so. Most adults go back to work about five days after surgery, and children can go back to school about seven days after surgery if they’re careful about playground activity. You may want to ask your child’s teacher to keep an eye on the child for a few weeks. Rhinoplasty, or nose reshaping, is one of the most common plastic surgery procedures. Rhinoplasty can reduce or increase the size of your nose or change the size or shape of the tip, bridge or nostrils. It can also correct nose-related breathing problems as well as disfigurement of the nose caused by trauma or birth defects. Rhinoplasty usually takes about an hour or two, though complicated procedures can take longer. During surgery, the nose is separated from its supporting framework of bone and cartilage and then sculpted into the desired shape. A splint is applied after the procedure to help your nose maintain its new shape. Nasal packs or soft plastic splints may also be placed in the nostrils to stabilize the septum, the dividing wall between the air passages. If your nose is being reduced in size, a splint will have been applied and the nose will be packed with a medicated gauze. Sometimes only tape is used to support the nose. The stitches are self absorbing and do not require removal. If an incision is made across the columnella, or vertical strip of tissue separating the nostrils, skin stitches are placed which require removal in 3-5 days. The need to do this is usually identified and discussed fully prior to the procedure, and is usually necessary in only about 5-10% of people. You will see some swelling and stuffiness for several weeks, but most patients resume normal light activity after a few days. It takes several weeks for the nose to completely heal for patients to return to full physical activity. 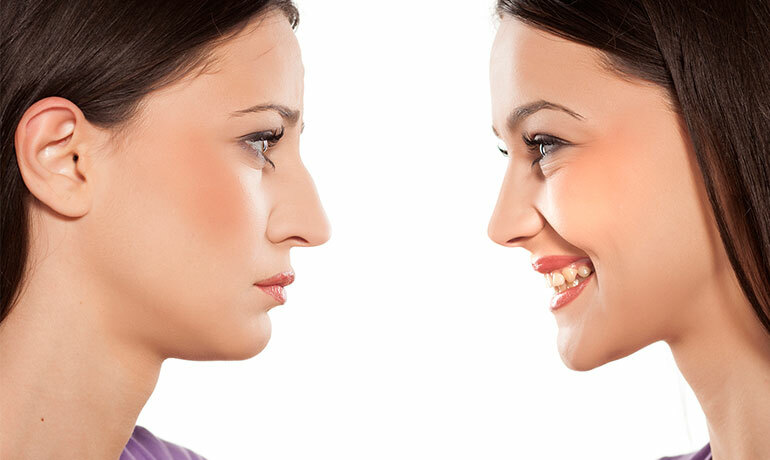 Many people blossom with positive personality changes after a nose-reshaping procedure. A new sense of confidence is the most frequently observed change. It’s important to remember: (1) results can take up to one year to be evident after surgery and (2) rhinoplasty changes the appearance that you and your loved ones have grown accustomed to. Chin implant surgery (or mentoplasty) reshapes the chin either by enhancement with an implant or reduction surgery on the bone. This improves the underlying structure of the face, providing a more harmonious, attractive appearance. Many times, a plastic surgeon may recommend chin surgery to a patient who is also having nose surgery to achieve facial proportion because the size of the chin may magnify or minimize the perceived size of the nose. 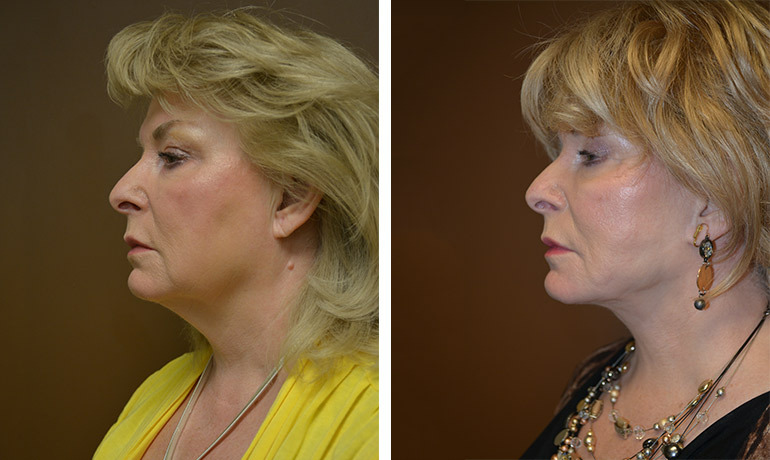 Chin surgery provides a harmonious balance to your features. Chin implants are made out of both solid and semi-solid materials. The implantation method must be tailored to the individual patient. A pocket is created at the chin and an implant is placed into the pocket. The incision may be placed in the crease lines under the chin or in the mouth. Some patients need more extensive surgery to re-position the bone of the chin. Some swelling and bruising can occur, but this can be treated by applying tape or other material. The tape is removed about a week after surgery. Pain and discomfort lasts for several days post surgery, but can be eased with oral pain medication. Some facial movements, such as talking and smiling, may be difficult for several days following the surgery, depending upon your personal recovery time.